Presenting, Aparna CyberZon - an address that is an oasis of calm, peace and magnificence in the hustle-bustle of the city, Hyderabad. Your home will now serve as a perfect getaway after a tiring day at work, as Aparna CyberZon ambiance will make you forget that you are in the heart of the city, Nallagandla. 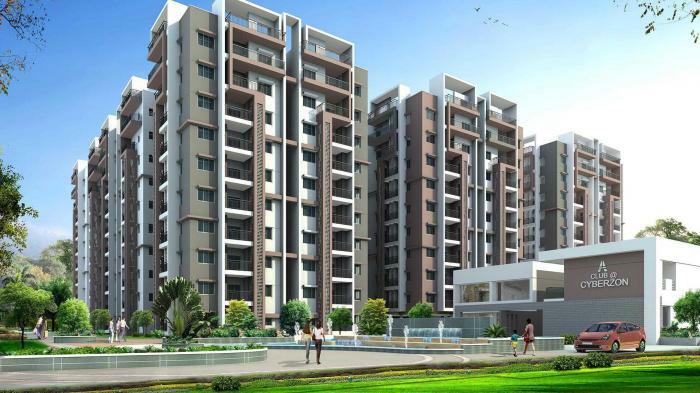 Aparna CyberZon is a large project spread over an area of 21.00 acres. Aparna CyberZon comprises of 2 BHK and 3 BHK Apartments in Hyderabad. Aparna CyberZon brings a lifestyle that befits Royalty with the batch of magnificent Apartments at Nallagandla. These Residential Apartments in Hyderabad offers limited edition luxury boutique houses that amazingly escapes the noise of the city center. Aparna CyberZon is built by a renowned name in construction business, Aparna Constructions And Estates Pvt Ltd. at Nallagandla, Hyderabad. The floor plan of Aparna CyberZon presents the most exciting and dynamic floor plans designed for a lavish lifestyle with 9 floors. The master plan of Aparna CyberZon offers people a strong connection to their surroundings, promoting a sense of community whilst balancing this with a distinct private address for individual homeowners. Amenities: Out of the many world class facilities, the major amenities in Aparna CyberZon includes Landscaped Garden, Swimming Pool, Gymnasium, Play Area, Club House, Tennis Court, Badminton Court, Gated community, 24Hr Backup Electricity, Basket Ball Court and Security. Location Advantage: There are number of benefits of living in Apartments with a good locality. The location of Aparna CyberZon makes sure that the home-seekers are choosing the right Apartments for themselves. It is one of the most prestigious address of Hyderabad with many facilities and utilities nearby Nallagandla. Address: The complete address of Aparna CyberZon is Nallagandla, Hyderabad, Telangana, INDIA.. Location of this project offers decent life style and has access to Schools, Parks. But does not have access to Cafes, Star Hotels. etc. It has access to Schools like Sancta Maria International School and Super Markets like New Needs And Needs and Workplaces like Innominds Software Pvt Ltd and Parks like Gulmohar Park and Malls like City capital mall This location is recommended for people who have 24x7 help for daily needs. SUPERSTRUCTURE 8" thick solid block work for external walls & 4" thick solid block work for internal walls. Internal/External One coat of plastering in CM 1:6 for walls and Single coat plastering for Ceiling. Two coats plastering in CM 1:6 for External walls. MAIN DOOR Teak Wood/machine made frame with moulded paneled shutter doors with Melamine polishing and reputed make fittings. INTERNAL DOORS Teak Wood/machine made frame with moulded paneled shutter doors with painting and reputed make fittings. FRENCH DOORS UPVC shutter styles and rails with float glass paneled shutters and designer hardware of reputed make. WINDOWS UPVC Window system with Float Glass with suitable finishes as per design. Grills M.S. enamel painted, aesthetically designed and fixed to wall, upto 2nd floor only. No grill shall be provided from 3rd floor onwards. and Corridors 24x 24 Vitrified Tiles. Bathrooms Acid Resistant Anti-skid Ceramic Tiles of reputed make. Dadooing in Kitchen Glazed Ceramic Tiles dado up to 2-0 height above kitchen platform of reputed make. Bathrooms 8"x12" Glazed Ceramic Tile dado of reputed make up to 7'. Utilities / Wash 8"x8" Glazed Ceramic Tile dado up to 3-0 height of reputed make. EXTERNAL Two Coats exterior Acrylic Emulsion Paint of reputed make over one coat of primer. INTERNAL Smooth Putty finish with Acrylic emulsion paint of reputed make over a coat of primer. Granite Platform with Stainless Steel Sink and treated water supply at one point. Provisions for fixing of Water Purifier, Exhaust Fan and Chimney. Washing Machine and Wet Area for Washing Utensils etc. Granite Counter Top /vanity type wash basin. Plug points for T.V. and Audio Systems etc. Telephone points in Master Bedroom and Hall. Two Nos of Passenger lifts (including one with higher capacity) per block with rescue device and V3F for energy efficiency. Entrance with Vitrified Tile Cladding. Water Softening Plant and Sewerage Treatment Plant. Car Wash Facility will be provided at an extra cost. D.G. Set backup with Acoustic enclosure and A.M.F. for Common Areas; 6 points in 2BHK and 7 points in 3BHK apartments. Ask from 2 other people who enquired about Aparna CyberZon. Review of Aparna CyberZon, Nallagandla? Its price, location, builder etc. Review of Aparna Constructions, Nallagandla? construction quality, trustworthy, delivery history etc.? Review of Aparna CyberZon, Nallagandla location? neighbourhood, connectivity, schools etc.? Comparison of Aparna CyberZon, Nallagandla to nearby projects? Is it rightly priced? What is your feedback on this Aparna CyberZon, Nallagandla? Depends on brand name and complete the project in time etc? Will this be a better option for investment or to live in Aparna CyberZon, Nallagandla? Can you give some suggestion? Is the Aparna CyberZon, Nallagandla has more potential in terms of capital appreciation, ROI, Rentals, Proximity to social infrastructure etc?